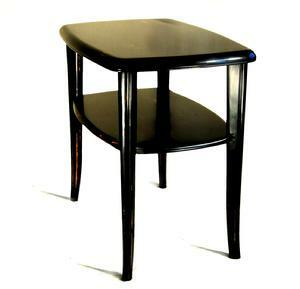 Rectangular modern form lamp table with customized contemporary high polish black lacquer finish. The notion of an apprentice table is that even professional finishers occasionally require a "practice item" upon which to develop and perfect new finishes, or a newer worker (an apprentice) may need extra practice learning a new finish. This lamp table was found in structurally solid condition with a rough finish. The table is likely maple or beech, and has been refinished first with a light walnut stain, and then lacquered in black with a hand rub-through high polish finish showing the stained wood tones underneath, creating a finish that we'll likely use again on other items. 26�w x 18�d x 25�h. "Very Good Original Condition." Table is very sturdy and solid. There are two depressions on the table top, the disguising of which necessitated the "rub through finish" as described above. No other dings or dents to any legs or shelf. Table was sourced through New England's largest auction house, and the H-W attribution is theirs; any further information along these lines is very much appreciated. Strong mid-century form with stylishly updated finish. Table is marked on bottom F2.3025.LAMP TAB / GLAMOURTONE 3. We also have a matching round lamp table in original rough finish that could be used as a mate to this table if desired (see MM014 HW Round Lamp Table); contact the gallery for additional information.